The days of legacy, expensive, independently managed Virtual Tape Libraries are dying and organizations are looking for modern alternatives with unified technologies. Cobalt Iron has innovated a software defined interface that is 100% integrated into Adaptive Data Protection (ADP) SaaS platform. Unlike any other VTL solution, ADP VTL is a software enabled feature that is directly integrated within an end to end data protection solution. With ADP VTL, organizations can deploy a single, unified solution that unleashes data from traditional VTL data silos all while modernizing VTL environments. Incredibly rich and customizable role-based access control is available to allow granular administration of ADP. 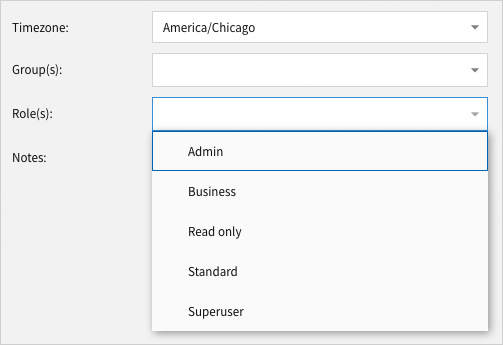 Default or custom roles can be assigned to users and groups or integrated with Active Directory (AD) or Lightweight Directory Access Protocol (LDAP). Permission levels may be customized by the type of user (admin vs. end-user) and by source of protected data. Access can be further customized through projects, locations, and over 50 selectable fine grain access elements. ADP can produce charge-back or show-back reporting for data protection services and monitor costs. For Managed Service Providers, these codes can be uniquely applied across multiple clients to appropriately reflect service levels. These features combine to provide a flexible billing solution to individual system owners, site managers, regional directors, and business unit owners. Billing options include internal show-back, internal charge-back, and customer billing. Additionally, billing codes can be applied at the organization, product, system, or system client levels. ADP’s RESTful API library and integration services were designed to ensure your existing automation and management systems are respected and leveraged. 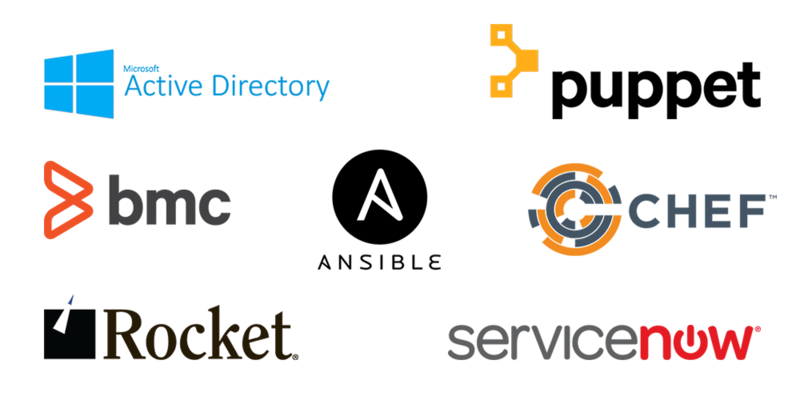 ADP tightly integrates with your existing defined management layers including ServiceNow, Active Directory, and Remedy, Ansible, Chef, Puppet, and ServerGraph. The ADP RESTful API promotes data protection to an automatic first-class citizen in the IT processes landscape. Traffic shaping is a type of network bandwidth management for the control and prioritization of wide area network (WAN) traffic. ADP data replication can consume every bit of bandwidth available bringing all other processes to a standstill. ADP introduces easy to use visual traffic shaping that requires no special training. Administrators simply identify the available bandwidth between two sites, the percentage of that bandwidth that should be used by backup, and the times – even different days of the week – when the usage is allowed. ADP manages, tracks, and analyzes the efficient use of the allocated bandwidth. Customers now have the ability log in to ADP “in-region.” This allows command and control of your ADP solution in country without having to traverse the public internet. ADP is available in 22 data centers world-wide to facilitate secure access and compliance. ADP delivers a single console to manage backup for the entire enterprise regardless of size or number of systems. Centralized management, global policy administration, and automated maintenance updates reduce management time while increasing reliability and performance. This logical grouping of information accelerates problem resolution since all the necessary data will be found in a single view whether on-premises, in the cloud, or a hybrid or multi-cloud combination. ADP delivers human-less automation of backup servers updates and upgrades resulting in 100% software currency. Maintenance for a specific server may include security enhancements, significant updates, or upgrades. The result is that customers operate in a data protection environment running the most powerful feature set with the most current security, features, and efficiency updates every single day. 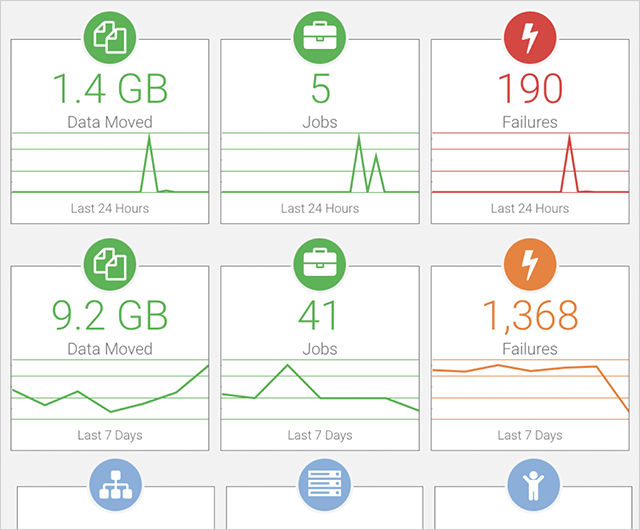 The centralized management of the entire data landscape in ADP enables clear insights for both data acquisition performance as well as recovery time optimizations. Combined with its underlying detailed insight, ADP gives users fast and simple insights into their operational coverage or their function or interest. The dynamic dashboard delivers optimal information to enable business to quickly make data-based operational decisions. Deploying and maintaining data protection agents has been difficult with traditional products. ADP simplifies this with automated installs for clients. ADP Accelerators remain continuously current by contacting the ADP Analytics Engine for patches, upgrades, updates, and also Agent software updates. Automated code updates deliver increased performance and reliability while eliminating a huge administrative burden. ADP allows customers to easily implement public cloud workloads for both source and target. ADP runs in 22 global cloud datacenters and has native integrations with the top five public cloud providers: Alibaba Cloud, Amazon Web Services, Google Cloud Platform, IBM Cloud, and Microsoft Azure. ADP brings an innovative framework for multi-tenancy allowing customers and Service Providers to maximize services while streamlining operational requirements. Customers can opt to treat individual teams and divisions as unique customers with their own landscape and logo/brand within the ADP environment. Service Providers can easily apply their own branding to ADP and resell it as their own. Multi-tenancy provides the ability to provide a diverse set of offerings to a complex collection of customers with simplicity and economic efficiency. Service Providers (xSPs) look to ADP for intuitive multi-site management of customer data protection. With an emphasis on customer experience, one key ADP feature is custom branding. Administrators can configure protection policies that apply globally or are applied on an individual customer basis. These policies enable xSP backup administrators to customize the services for each customer while adhering to global standards with a consistent branding experience across customers or uniquely for one customer as desired.